"I hope I don't sound ridiculous!" Lydia Ainsworth yelps at the end of our Skype convo, a half–hour zipwire between out–of–body experiences, sacred gemstones and social media–induced freakouts. It's not that we don't want to reassure her, but the chat certainly raises more questions than answers. Still, given her beguiling future–pop tunes, you suspect that's Ainsworth all over: the deeper you dig, the denser the soil. Earlier this month, when the alluring, Arbutus Records–endorsed song "White Shadows" fell like a perfectly formed snowflake into the internet's palm, Ainsworth's story remained to be told. Let's cut through the mystique: the musician grew up in an artistic household soundtracked by Bjork, the Beatles, Nirvana and Arvo Pärt. Her dad was, and remains, a singer–songwriter – "like Van Morrisson and Joan Armatrading combined", she says – and her mum a set designer. After taking up cello at 10, cutting her teeth in the school orchestra and eventually graduating from Etobicoke School of the Arts (the same Toronto high school that spawned Broken Social Scene), the aspiring composer began a course scoring student films with a 50–piece orchestra. Suddenly abuzz with cross–campus hype, Ainsworth looked further afield and landed an NYU bursary. She decamped to Brooklyn, where her worldly possessions were a gemstone–encrusted keyboard and laptop crammed into a gym–locker of a bedroom. "My room," she recalls, "was literally the size of my bed. Then my next place was maybe twice that size. But New York is great because everything you need is on the street – I furnished my whole place with stuff I'd find in my neighbourhood." That sense of discovery defines her debut EP Right from Real Pt 1, the culmination of two and a half years sequestered away while studying with Joan La Barbara in New York. Like a fever–dream of Julia Holter merging with Grimes, Ainsworth's future visions weave neoclassical flourishes and enchanted melody–mangles into cool 80s sound–beds, and it sounds fantastic. Look forward to Part 2 in the near future, but for now take a ride on Lydia Ainsworth's magic carpet. Lydia Ainsworth: I was absolutely terrible! Really bad at cello. I taught myself, and I was just awful. But I loved playing in the orchestras and sitting at the back – when you're really bad you sit at the back – so I would sit there and fake my way through, listening and absorbing and loving everything we were playing, from Ravel to the impressionists. And you moved into film–scoring at McGill University. Lydia Ainsworth: It was an amazing programme. It was a seminar put on for a few years that allowed the students to score for 50–piece orchestras – it's completely overwhelming to hear 50 people play something you've written! I guess you're recreating the orchestra in your computer. Lydia Ainsworth: Yeah, exactly! I would love to write for choir – the human voice is so powerful. I was really inspired by Meredith Monk, who a teacher introduced me to. Why record a pop–ish EP? Lydia Ainsworth: In general, when I write music I'm aiming to tap into an alternative experience. I'm always chasing a feeling of magic and aliveness, and a feeling of seeing things a little differently that you never noticed before. Everything we experience in our daily life is distorted through acquired habits. Lydia Ainsworth: Yeah – we're constantly bombarded by streams of images and sounds blasted through advertisements, the internet and the media in general. With the EP, I was drawn to explore dreams and inspirations that pervert those comforts. Day to day, what's that bombardment's impact? Lydia Ainsworth: It numbs us. We need to break out of our daily stupor. We're boxed in, without a larger perspective on life. What first got you thinking about that? Lydia Ainsworth: Well, I wrote the song "Candle" on one of my birthdays, and I wrote it right after everyone had written on my Facebook wall. (laughs) And I was getting all these messages from people that I hadn't talked to, and I actually didn't even know. And even though it was really lovely, it felt a little bit fake. There does seem to be a sense of duty. Lydia Ainsworth: Yeah. That was my way of responding – trying to find something true and authentic in our lives. You've also talked about dreams and disembodiment – have you had out of body experiences? Lydia Ainsworth: Yeah I have! Plus, a lot of my vocal treatments were inspired by these paintings of women depicted as if having an out of body experience. 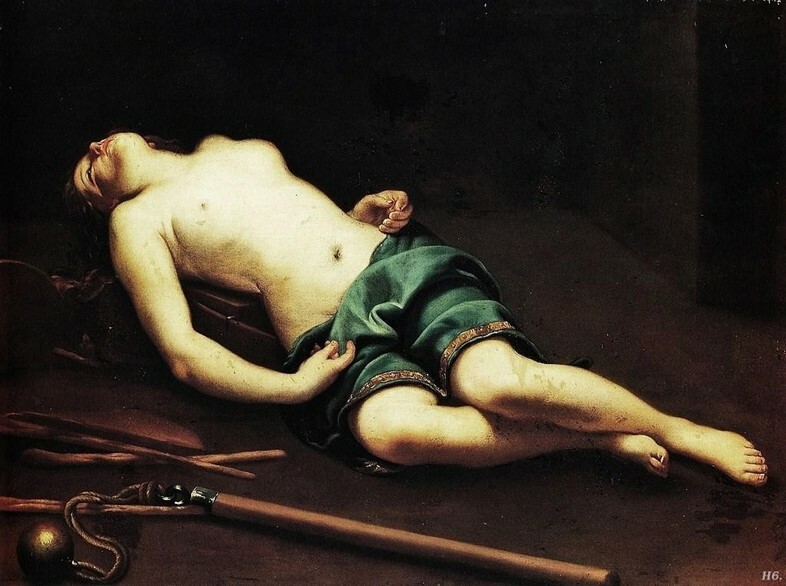 They're by Guido Cagnacci – he was a Baroque artist – who started out painting in the church but later found work in private salons. He painted these very salacious women on the brink of death – icon figures like Joan of Arc and Cleopatra – and I was fascinated by their facial expressions. I wanted to embody that in my vocal treatment. And yeah, I had an out of body experience while writing the songs, when I had my appendix taken out. I had extremely vivid dreams that felt like nothing I'd ever experienced before. That feeling definitely inspired the way I wanted to use my voice. Recording the EP in New York, were you sort of reclusive? Lydia Ainsworth: I was incredibly isolated and reclusive. My roommates thought I was crazy, they were always joking about it. 'Get out the house!' I didn't know what they were talking about until I finished the songs. That was the strangest experience, like 'Now what do I do?' Having taken some time off, I do feel like it was a little bit unhealthy. I'd love to work with more live instrumentalists next time. What's the story behind "Malachite"? Lydia Ainsworth: Two of the songs on the EP, "Malachite" and "Take Your Face Off", the lyrics are by a filmmaker called Matthew Lessner. I was really drawn to them because I could interpret them as a person outside of myself, and feel safer. "Malachite" is from the perspective of a little boy who's telecommunicating – I kind of pictured myself as Danny from The Shining. You seem sort of obsessed with getting inside other people. Lydia Ainsworth: I definitely have a fascination with that, yeah. I was drawn to it, sometimes without realising.